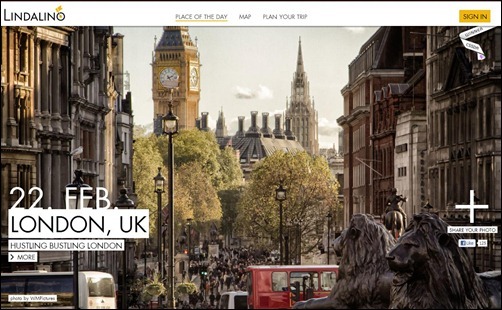 This is among the beautiful travel web designs. 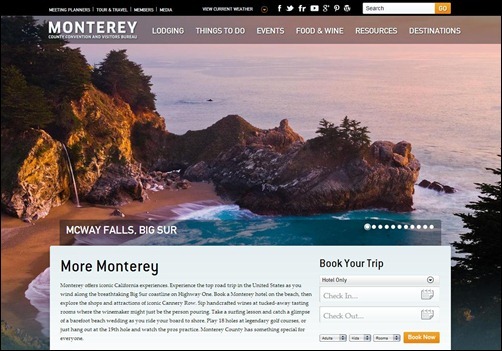 This site will definitely make you want to visit Monterey, California. Take a long road trip in the US as you can wind along the breathtaking Big Sur coastline, enjoy the luxurious hotel on the beach and take surfing lessons, or simply explore the shops and attractions of the infamous Cannery Row. Monterey is just what you exactly want for a memorable vacation. If you want to have a great winter vacation of your lifetime, Visit Norway! The ski season lasts for half a year with a friendlier climate because of the Gulf Stream. Fjord has the best main ski resorts and is easily accessible by plane from most European countries. 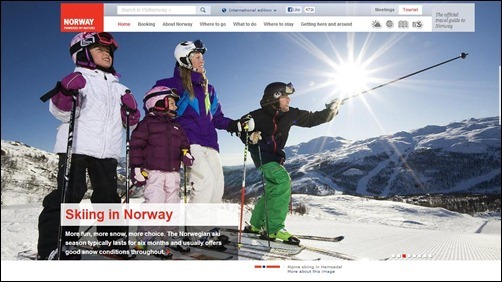 Travelling Norway can be very affordable, this website will tell you how. LindaLino showcases enchanting and alluring photos of top destinations around the world. They will choose the place of the day and use it as a background of their website. It provides a visual pleasure for visitors who plan a trip for the holiday. One big photo will certainly captivate every traveler who wants to spend a memorable vacation. 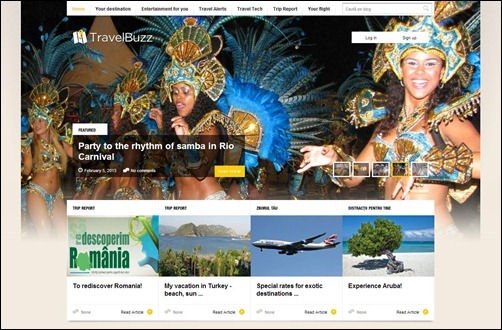 Into Brazil offers a great travel website design aimed at creating virtual travel experience to this fifth largest country in the world. They have a very huge territory waiting to be explored by travelers. It can be quite hard to choose a place to visit but this website will give you a detailed information and a closer look at Brazil’s top destination. 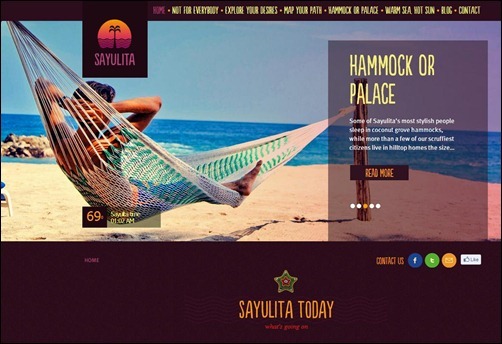 Sayulita Beach travel website design is simply astounding! 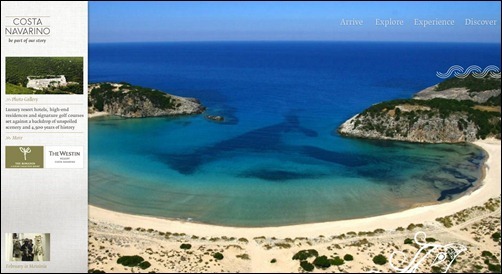 The background and photos used in the site makes every beach lover’s desire transform into realities. It a small Mexican fishing village near Puerto Vallarta and is mostly popular with surfers. In Sayulita, you can just walk a beach front road and find a trail where you can chase butterflies into the jungle or explore the streets and byways and find what you seek in a secret shop. Astoria Villa has the best hotel website design that showcases a slideshow of the rooms and amenities with a luxurious and elegant look. 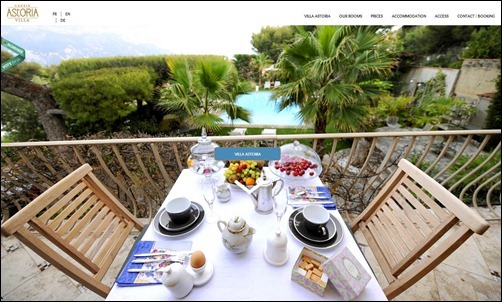 It is located in the peninsula of Cassis, France, Astoria Villa received thousands of positive reviews from their customers for such a comfy stay and warmth service. It is just 5 minutes away from the harbor, beaches and creeks and you will surely enjoy the sight of the Cassis Bay and the masterful Cap Canaille. 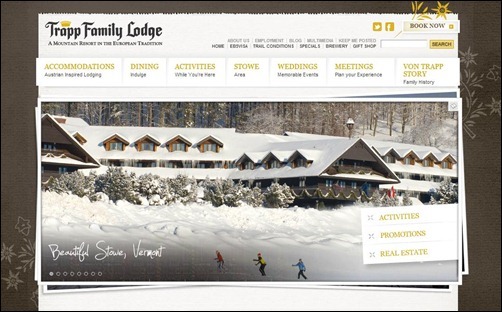 Trapp Family Lodge’s hotel web design is so extraordinary and very captivating. It features a large photo of the lodge which highlights the Austrian culture, cuisine, sightseeing attractions and so many more. It is located on 2,500 acres in beautiful Stowe, Vermont, the Trapp Family Lodge is a luxury mountain resort with an Austrian-inspired architecture and European-style accommodations. It offers a magnificent mountain views, outstanding comfort and superb service with indoor and outdoor resort amenities. You will surely enjoy the Von Trapp history tour if you are a “Sound of Music “ fanatic. 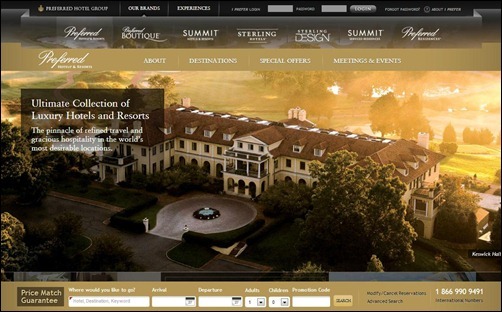 Summit Hotels and Resorts embody a top caliber hotel website designs for your inspiration. It is an ultimate collection of luxury hotels and resorts situated in the most desirable destinations around the globe. They offer highly personalized service and an unparalleled guest experience for discerning luxury travelers. France’s second largest city made it to the top tourist destination according to Fodor;s list, Travel + Leisure and National Geographic magazine. 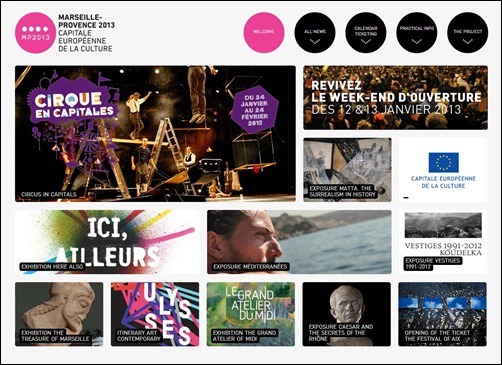 My Provence site showcases the event featured in Marseille, tagged as the European capital of culture. Style seekers browse the racks in the Cours Julien district, artists are colonizing the Le Panier are and trendy types hole up at the Philippe Starck’s Mama Shelter. 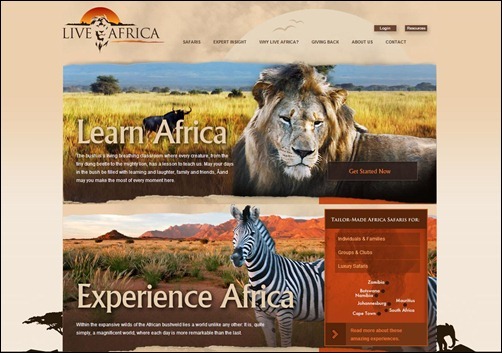 Live Africa takes you to a great safari experience. The website presents a journey into the wild that captures a breathtaking place where every creature, from the tiny beetle to the mighty lion, can be found. This is definitely an adventure everyone would want to experience! 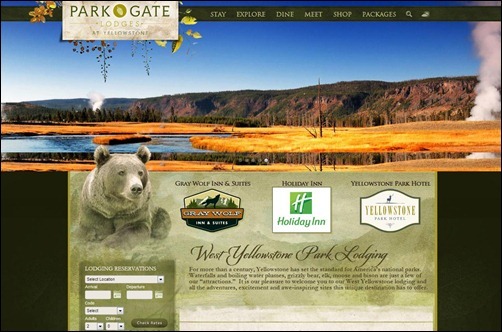 Yellowstone Park travel website design is just so alluring! It sets as a standard for America’s national parks with its glorious waterfalls and boiling water plumes, grizzly bear, elk, moose and bison. During winter, it transforms Yellowstone into a crystal wonderland where the geologic “fire” that simmers just below the surface reacts with the ice and snow of the season. Experience magic! Enter into a timeless world of fantasy and adventure. Disneyland is a dream destination for kids and kids at heart. This travel website tells a story to people’s fancy and personal values and making their dream come to life. 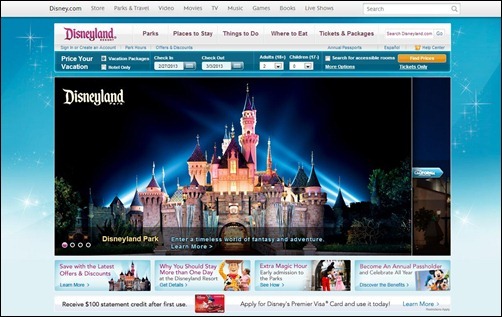 It is a theme park owned and operated by the Walt Disney Parks and Resorts. This capital city of Netherlands is one of the top destinations among travelers. This year, they will celebrate a milestone for the Royal Concertgebouw Orchestra’s 125th anniversary, Van Gogh’s 180th birthday, the Artis Zoo’s 75th anniversary and the 400th anniversary of the Canal Ring. Amsterdam made it to three lists for 2013; Fodor’s Go List, Lonely Planet Top 10 Cities and Travel + Leisure magazine’s hottest travel destination. 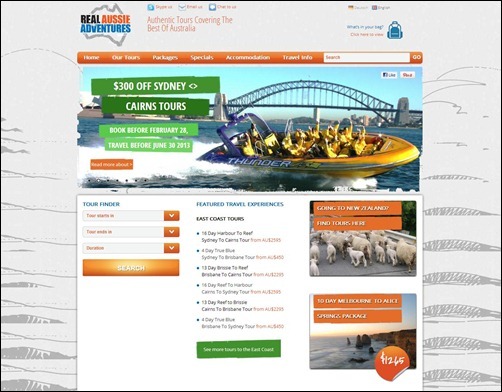 Real Australia Adventures offer vast options for travelling and exploring the land down under. With so many tourist spots in this country, you can get a range of small group adventure tours and exciting programs. They don’t provide you with everything in this website, they only show you the best so you don’t waste your time and make your holiday memorable. 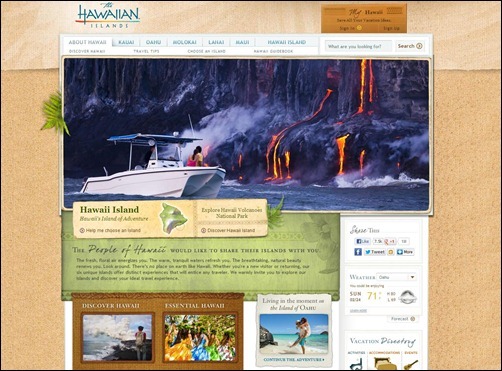 Hawaiian Islands is one of cool travel sites that displays the beauty of nature. The warm, serene waters are so refreshing while the fresh, floral air gives you energy. These beautiful islands will bring distinct experiences that will attract tourists and travelers all over the world and discover the ideal travel experience. 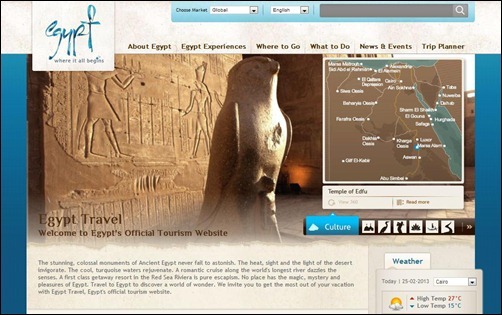 Egypt’s official tourism website speaks of mystical and invigorating travel website design. The gigantic monuments of Ancient Egypt have always been astounding wanting everyone to travel back in time. A romantic cruise along the world’s longest river is also an ideal getaway for couples and check in to the first class resort in the Red Sea Riviera. There is no other place collaborating magic, mystery and pleasure comes to life. Costa Navarino is the capital city of Messinia which has a stunningly diverse landscape and a unique habitat. It boasts of pristine coastlines which are among the longest in Greece, green rolling hills, rugged mountains, secluded bays and endless sandy beaches, crystalline lagoons and hidden waterfalls, all these and more in one prime destination in the Mediterranean. 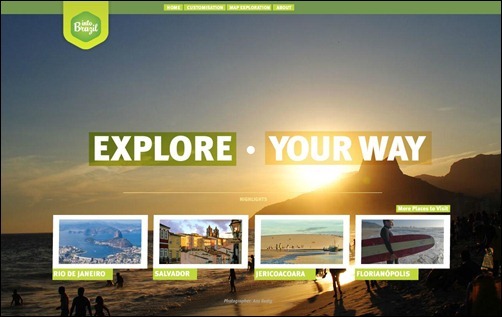 This is one of the cool travel websites that will entice you to discover this beautiful place. Treat yourself and your family with this breathtaking and magnificent archipelago, the Bahamas islands. The homepage of the website will show you the map that will take you to an island hopping trip and gaze to the wonder of the incredible nature that will make your holiday worthwhile. The site also gives you reasonable package and you can book your trip upfront. 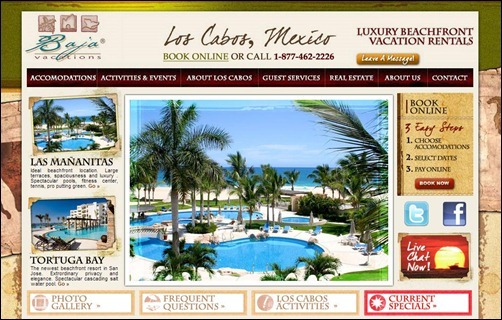 One of the best travel agency websites is Baja Vacations. With their colorful design, textures and fascinating photos, they get you itching to travel to this beautiful place in Los Cabos, Mexico. Booking and paying for your vacation rentals to beachfront condominiums, hotels, villas and penthouses are made easier and accessible online. Baja vacations personally know the natural wonder, delightful people and the adventure that awaits you. Travel Buzz will take you to your dream destination! 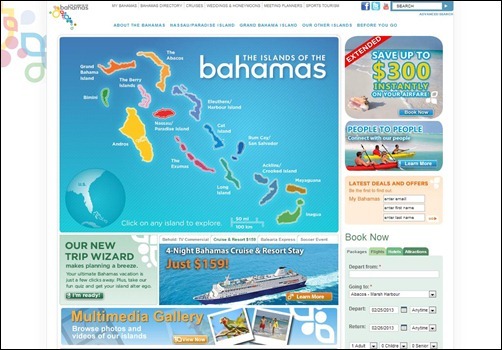 It is among the best travel website design that allows you to easily look for everything you want for a carefree trip. The large scale photograph displays culture-specific and fun moments of your desired vacation spot. Whether you want to rediscover Romania, witness the international film festival in Berlin, or see the colorful carnival in Basel, Switzerland that is comparable to that in Venice and Rio de Janeiro, you get the pick your choice instantly. 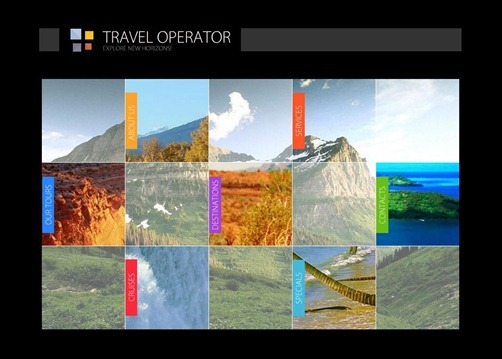 Whether you want to travel to North and South America, Asia, Europe, Africa or Australia, Travel Operator can give you an exhilarating experience of a lifetime. 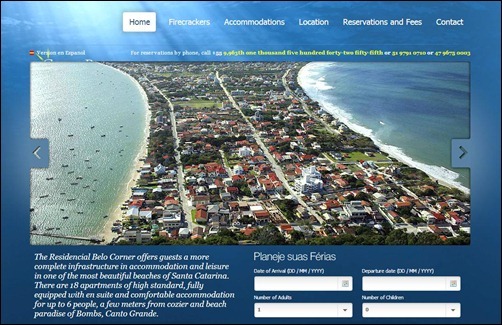 Because of the unique and out-of-the-box travel website design, visitors will be enticed to make a reservation. This site combines a static structure with dynamic flash effects and fancy flash photo gallery that will surely attract travelers. 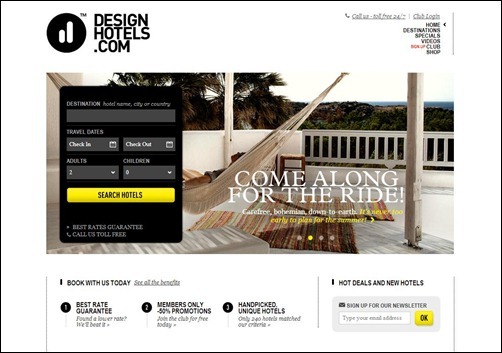 Design Hotels has the simplest and tidy web design that’s dominant with black and white background and fonts. Aside from easy booking and reservation process, they offer lots of discounts and perk to the world’s top destination spots. They also showcase the latest and modern hotels available in the location of your choice. If you want to witness any sports event, Global Team Travel is here to take you to the venue anywhere around the world. They will provide you with an unforgettable sports tours from large international tournaments to customized friendly tours. 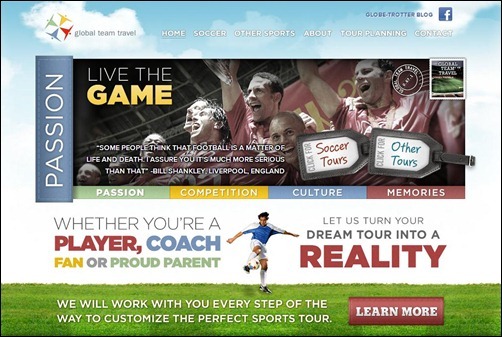 The website shows you with a bright color and eye-catching images of sports fanatics and events. Explore the unspoiled wilderness of the Southern Forest in Western Australia where you can unite with the nature while enjoying the theatre of the bush right outside your cottage veranda. Clover Cottage is situated on the banks of the magnificent Warren River that provides an aura of romance and tranquility perfect for couples. 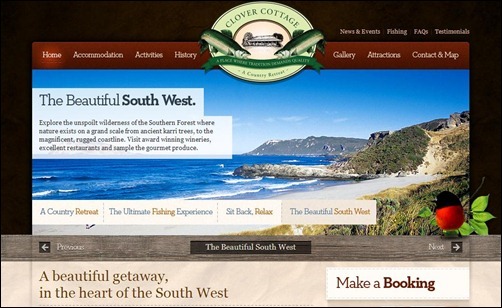 This travel website design can get you to this lovely place in an instant. CantoBelo provides a complete infrastructure in terms of accommodation and leisure situated in one of the most beautiful beaches of Santa Catarina in Brazil. It is where you can find Firecrackers, Bombs and Canto Grande which is known to be a paradise of natural beauty. It is filled with so many tourist attractions and is a great option for those who want to enjoy pleasurable moments with families and loved-ones. 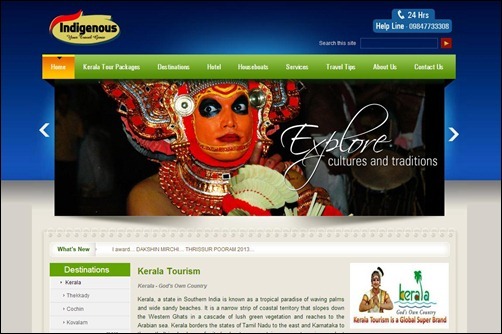 Indigenous Tours makes use of a travel website design that portrays the tradition and culture of India. They offer a well-planned package tour to their clients around the world with so many tourist attractions travelers must visit. They focus more on South India but also covers international and North Indian destinations. 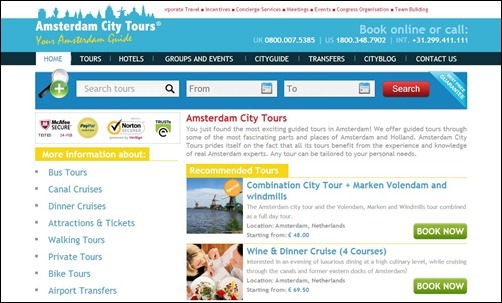 The images that this travel website design projects bring forth a captivating and enticing invitation among online visitors. The site attacks the travelers on the photography aspect than text. Here, you will discover that Utah is a place of a profound natural beauty. 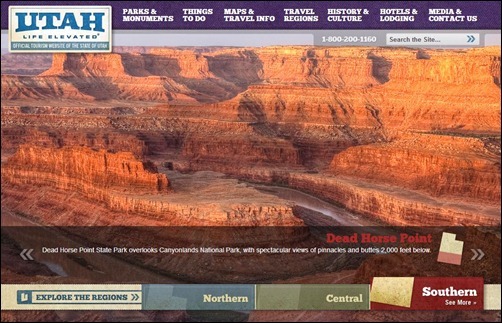 It highlights the unique natural formations, national parks and tourist attraction that contains the best elements of great Mountain West and the Desert Southwest, from red rock splendor to mountain peaks with the greatest snow on earth. It is a four-season world class travel destination. 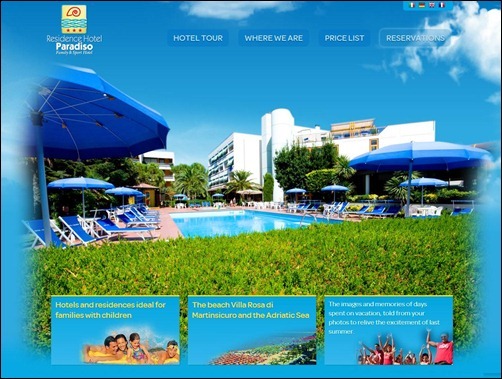 Hotel Paradiso exemplifies the best hotel website design that engrosses the eyes of travelers around the world. This is actually ideal for family who wants to spend an unforgettable summer vacation of a lifetime. They offer exclusive services for children and young people, animation, mini club, games for children and the legendary Cub Club. Families who visit this place can also share their happy moments by posting their souvenir pictures in their website. Another exciting and fun way to spend your holiday is travelling by sea. 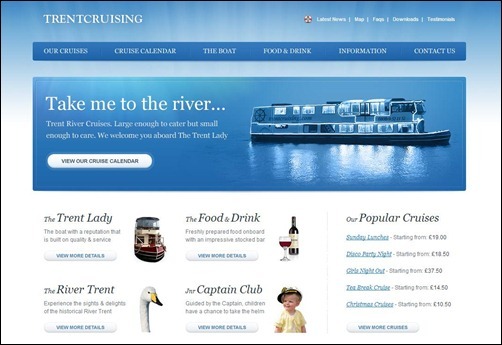 Trent cruising is one best example of a travel website design that offers a wide range of cruise packages which can be customized to suit your travel requirements. The Trent Lady River Boat has gained a reputation for exceptional quality and outstanding service. Idaho is much known of their “famous potatoes.” But this website will show you the other side of this bountiful state. 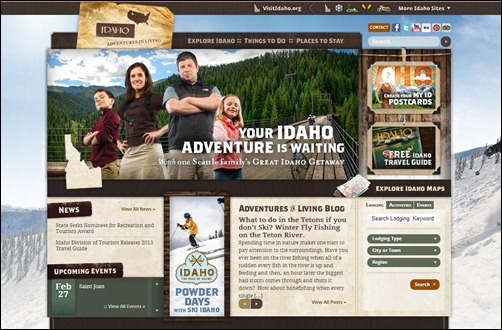 Visit Idaho website depicts the state in a homey and personalized way that will persuade travelers to explore their natural beauty and create their own adventure with vast options for tourists.